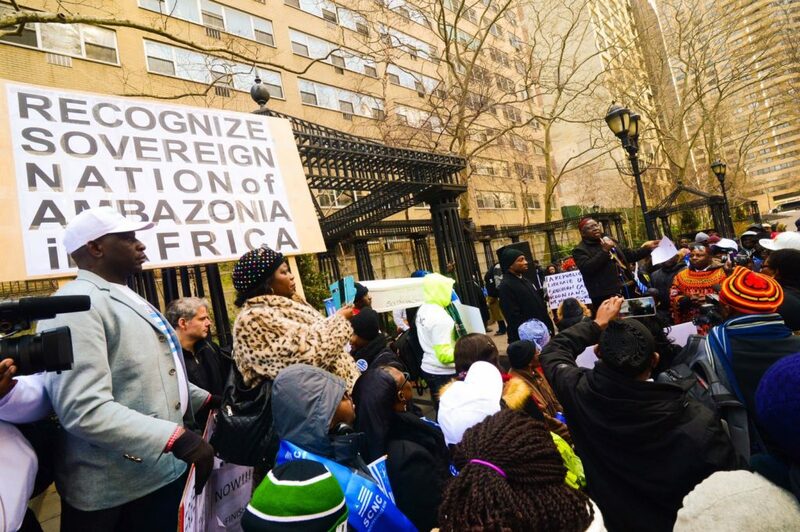 New York, Saturday, 4 March 2017 – An estimated 600 Southern Cameroonians converged Friday, 3 March 2017 on the doorsteps of the United Nations Headquarters in New York, delivering the flag of their country as a gift to the world body and bringing their cries against recolonization and decrying acts bordering on genocide by the Republic of Cameroon (independent on 1st January 1960) on the people of the former British Trust Territory of Southern Cameroons (independent on 1st October 1961). Speaker after speaker at the rally decried colonization as a crime against humanity, but one that has been going on for many long years under the watch of the United Nations. 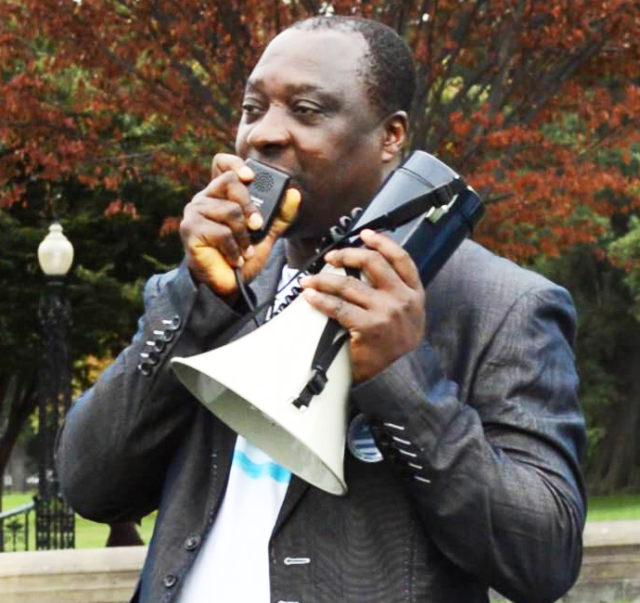 “Enough is enough,” shouted the crowd in agreement with activist Kima Tabong from the Boston delegation whose brief remarks focused on reminding the United Nations that the colonization of Southern Cameroons has now been on for 159 long years. Speakers also insisted on the hope that such rallies are meant to sustain. “I have no doubt in my mind that the independence of Southern Cameroons will be restored,” said Barrister Syh Ambe, adding: “While our people at home have a duty to resist the colonizer, those of us abroad have a duty to insist and to persist in this fight through rallies like this one until the independence of our homeland is restored”. A few speakers earlier, the German-born Christoph Messner, who is so in love with Ambazonia that he has claimed the right to the first passport of a naturalized citizen of the new country told the crowd that even if he could not tell when independence and freedom were coming, he knew that it was coming “sooner, rather than later”. The leaders of the liberation movements that pulled together the rally despite failing to hold a mini-summit convened for the night before used the opportunity to reassure followers that something was being done to form a more united front and an even better coordinated approach to the struggle. “I promise you that we will be united within one week,” pledged Elvis Kometa, leader of SCNC-North America, calling on what he called “so-called leaders” to realize that the struggle for independence is bigger than any one of them or their movements. “We are working to see how all of our groups can come together and work together,” promised Sesekou Christmas Ebini, spreading the message of “collective love” as he termed it. “Let us not only concentrate on the negatives. There are negatives, but there are also too many positives in this struggle and we should highlight them too”. Barrister Harmony Bobga stressed the need for a division of labor approach. “Let us identify who can do what best and assign them that task,” said Barrister Bobga adding: “Let us stop this fighting of one another.” According to him, strength will be built through members making sure that the movements they support do not perish. “When you pick a mango under a tree, make sure you put manure under the mango tree,” Barrister Bobga told the crowd. The admission is that members of the Southern Cameroonian Diaspora can only travel back to Southern Cameroons at their peril. The colonial regime of Yaounde has blacklisted most Southern Cameroonians and are indiscriminately targeting them for arrest and detention at the Kondengui Prison. 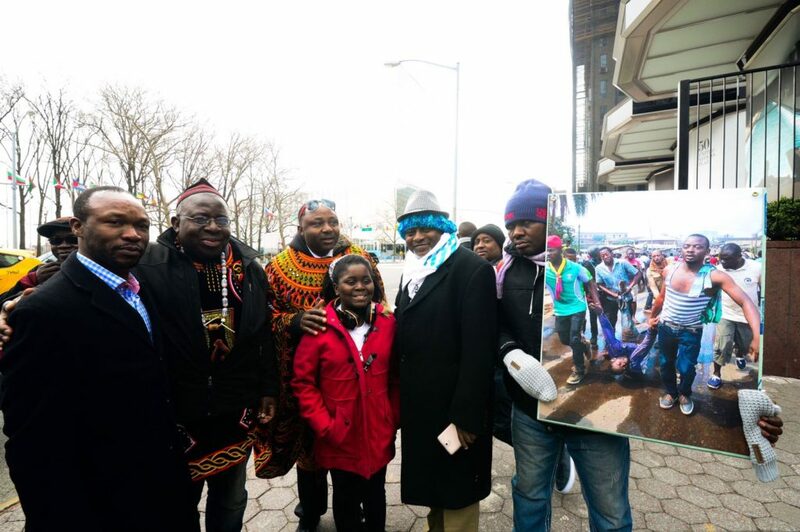 A few moments were spent at the New York rally to thank God for the safe return to the United States a day before of Mr. Brado Tabeyang, who upon arriving Cameroon on a plane from Washington, DC, was arrested, briefly detained, tortured and then deported back to the United States. He becomes, in the words of Barrister Syh Ambe: Southern Cameroons’ “Deportee Number One”. In his typical firebrand style, the leader of the Ambazonia Governing Council (AGC), Dr. Lucas Cho Ayaba, delivered one of the most beautiful speeches of the rally outside of Ray Baba’s emotional appeal. “I have come here as a soldier of the revolution,” Cho Ayaba told the crowd, inviting them to join him in soothing “the pain of the mothers, the yearning of the fathers and the doubts plastered in the faces of our kids” shocked by the level of brutality put on display by the occupation forces of La Republique du Cameroun. “We are not going to allow an alien, dominating power from Yaounde to dictate what we should do on our own land and country, or which language we must speak, what language to use in courts or to dictate the school curriculum. We will give our lives for Ambazonia. We will fight together, and go to jail together, so that one day we will be free together”. 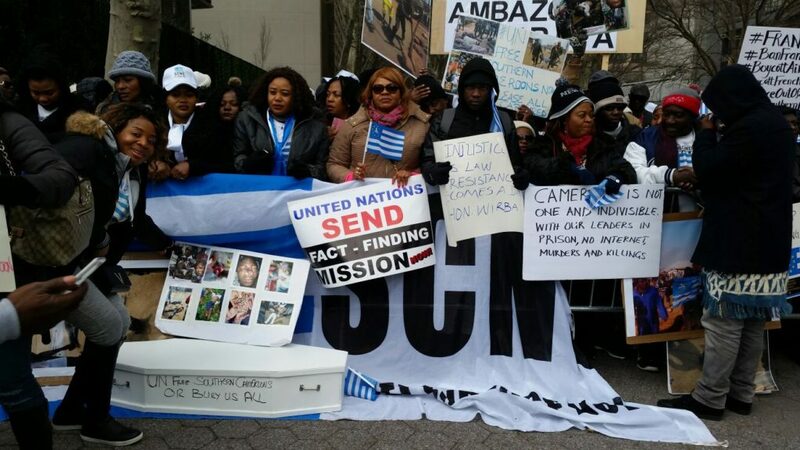 “We have come here,” said Cho Ayaba “to tell the United Nations that the land they mortgaged to La Republique du Cameroun will be captured by the people of Southern Cameroons.” He said more rallies must follow to decry the “complicity of the United Nations and the criminal silence of the United Kingdom” to the recolonization of Southern Cameroons. From New York, Ntumfoyn Boh Herbert, the spokesperson of MoRISC (Movement for the Independence of Southern Cameroons) announced a campaign to mobilize Southern Cameroonian women in the Diaspora to join the struggle on the occasion of the International Day of Women (8 March 2017). He also announced the first worldwide rally of the Southern Cameroonian Diaspora to be held in London on 21 April 2017; and a return to New York later in the year. An extremely eloquent young activist, Ray Baba, representing the New York City delegation absolutely thrilled the crowd with the rendition of his version of the “I have a Dream” speech, ending his litany of beautiful dreams on Southern Cameroons with the following one: “I have dream; that one day, citizens of La Republique du Cameroun will line up at the embassies of Southern Cameroons asking for visas… and guess what? We will turn most of those visas down”. In line with speakers before him, Ray Baba, reassured grieving, imprisoned and violated Southern Cameroonians at home that their fellow citizens in the Diaspora feel their pain and are united with them in spirit. “When you mourn, we mourn with you. When you are in those prison cells, we are there with you. That is why we are bracing this cold weather to attend this rally. We shall not let the international rest until Mr. Biya gives us peace”. An 11-year-old girl, Helen Rose, who spoke earlier, had called colonial Yaounde out on the many crimes it was perpetrating with such impunity. “It is not right for them to be doing all these bad things to other people, because we are part of humanity; and if we are all part of humanity, then putting others down won’t lift us all up”, said the young Helen Rose. “I also believe that the killing should stop,” she added. At the end of the three-hour long rally, a three-person delegation from the demonstrators was received inside the United Nations main offices by a three-person from the Office of the United Nations Spokesperson, Stéphane Dujarric, and the UN Division of Human Rights. 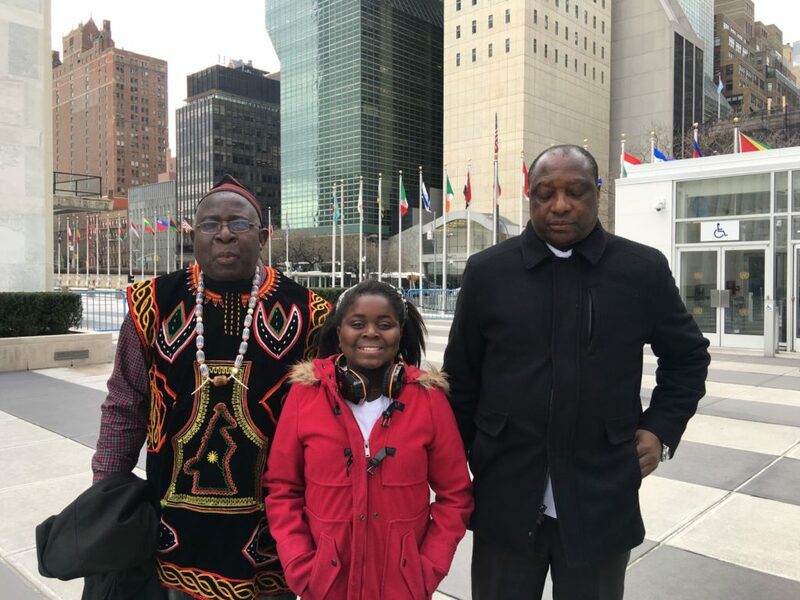 Eleven-year-old Helen Rose, who was the youngest speaker at the rally representing young people and generations yet unborn, joined the leader of the North America chapter of SCNC, Elvis Kometa, and the spokesperson of MoRISC Ntumfoyn Boh Herbert. The delegation said they had come to thank United Nations Member States for voting (50 YES votes to 21 NO votes and 6 abstentions) on 21st April 1961 for the independence of Southern Cameroons. They said they had come to remind “Member States that our independence never materialized” and to seek the support of Member States “in seating our country as a full member of the United Nations when a vote comes before the General Assembly”. The memorandum came with the flag of the Federal Republic of Southern Cameroons, hand-delivered for the attention of United Nations Secretary General Antonio Guterres and for the attention of the Chairman of the United Nations General Assembly Fourth Committee in Charge of Decolonization, Mr. Vladimir Drobnjak. The memorandum calls on the United Nations, among others, to urgently to deploy United Nations Peacekeepers to “end collective punishment, prevent crimes against humanity and acts bordering on a Rwanda-type genocide in Southern Cameroons”. It invites the United Nations to “end the ongoing military occupation, annexation and colonial rule of Southern Cameroons by the Republic of Cameroon” underlining that these acts are “in violation of Article 4(b) of the African Union Constitutive Act” which recognizes African countries as being frozen within the borders inherited from colonization. To this effect, the petition accuses the Republic of Cameroon of illegal occupation of Southern Cameroons “in manner similar to the illegal occupation in 1975 of East Timor by Indonesia and of Spanish Sahara by Morocco”. The petition also urges the United Nations to “reaffirm and uphold the full implementation” of UNGA Resolution 1608 and to “recognize and uphold the right of Southern Cameroons to peacefully separate from the Republic of Cameroon… under Principles VII and VIII of UN Resolution 1541 of the 15th of December 1960”. The delegation to the United Nations also hand-delivered the “Declaration Invoking the Inalienable Rights of Self-Determination and Rights to our Nationality” which was adopted the weekend before at the constituent assembly of SCACUF (Southern Cameroons/Ambazonia Consortium United Front) held in Lagos, Nigeria. The SCACUF get together in Lagos brought together leaders of SCNC, SCAPO Ambazonia, SCYL, the Cameroon Anglophone Civil Society Consortium, MoRISC, Southern Cameroons South Africa Forum, and Southern Cameroonians in Nigeria. Attendees at the March 3 pro-independence rally on the doorsteps of the United Nations in New York on Friday travelled hundreds of miles from all across the United States and neighboring Canada, putting their great sense of commitment to the struggle on display through the sacrifice of their time and resources. All participants paid from pocket for plane, train and bus tickets to be a part of what turned out to be the biggest rally yet to be staged in the United States – or anywhere else in the Diaspora – by Southern Cameroonians. Attendees defied a chilly, windy and bitingly cold pre-Spring Friday to attend the rally held at Dag Hammarskjold Plaza, across the street from both the UN Headquarters and Trump Tower. Five fully packed buses, seating 55 passengers each, loaded from and drove out of the Washington, DC, Metro Area alone; not counting the minivans and cars that ferried Southern Cameroonians to New York City. Two buses brought Bostonians from the great state of Massachusetts into New York, in what they wanted to symbolize the march on and defense of the city of New York by soldiers coming from Boston in the days immediately following the Declaration of Independence by the Congress of the United States of America. Buses and trains also brought participants from neighboring states (Connecticut, New Jersey, and Delaware) but also from the far flung states such as Texas, Michigan, Georgia, South Carolina, and North Carolina. By Saturday night, postings on social media by some of the organizers appropriately included “high-fiving” self-congratulatory messages about the rally. “We just returned from New York where we scored a ‘fatly, bigly, huge’ win”, exclaimed Vyvian Mbanwie on WhatsApp, a week before another major independence rally – a town hall event – is due to hold in Houston, Texas. I don’t even care if my email is published. Let us separate I like the fight our brothers abroad are fighting.. We anglophone students are so sure to school for our lives and remain jobless because of the maltreatment we get from our LA francophone government . WE WANT SEPARATION. 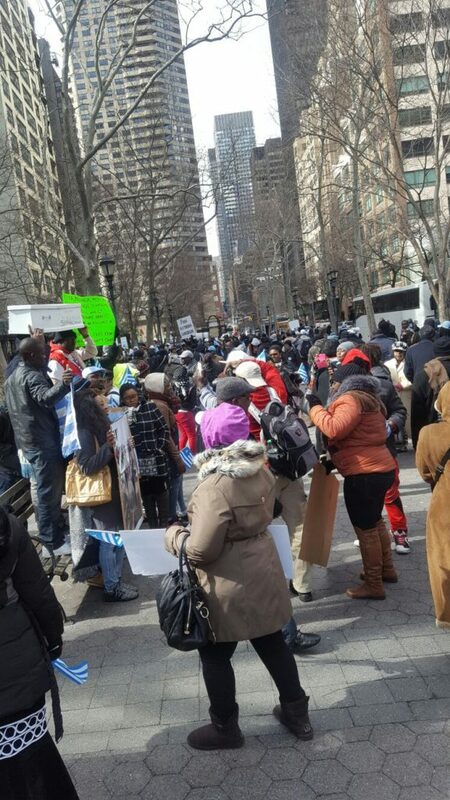 ..
Those who commented here that members of the diaspora are misleading Ambazonians back at home by causing them to miss work and school while they do go to school an make money outside Ambazonia, here are folks who took off work to be in NY in extremely extremely bitterly cold winter weather to fight for BSC/AMB freedom. A few weeks ago, some of these same folks missed work and lost wages/income to travel the distance out of town to Hagerstown to fight for our freedom. The combined loss of wages/income for these participants is huge, but worth the fight. Some attendees also came from Europe, though inadvertently not mentioned in the article. Soon some will make things up about an imaginary nonexistent fight for “so called” government positions Mop no get Sunday! Chares: i don’t think you can make this comparison, those kids home haven’t been to school since December, the cold in diaspora is better than the kidnap, torture and killings our brothers and sisters face back home. I just think we have the wrong strategy, if you want independence pick up arms and defend all strategic positions, now LRC has militarised southern cameroon, how do you plan to get the independence? No country will give up part of it’s territory without a serious fight.